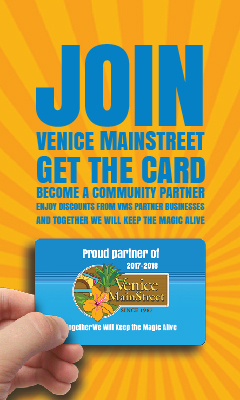 Welcome to our shop near the sands of Venice beach. Like the waters of the Gulf, we offer a wide array of colors, textures and activities. From yarn to knitting to crocheting, we have it all. Shop Patchington for the latest in fashionable women's apparel and accessories. Shop online or visit one of our many boutiques. At Patchington... we're all about having fun, creative self-expression and lasting relationships! Scarlet Macaw Resort Wear: Fun, Florida fashions! Our brands include Cottonseed, Victoria’s, Lost River, Euro, Marushka and many more. We treasure our customers and pride ourselves on friendly service, excellent selection, and affordable pricing. We have been in business in Venice, FL for 25 years and enjoy supplying locals & visitors alike with fashionable women’s wear. 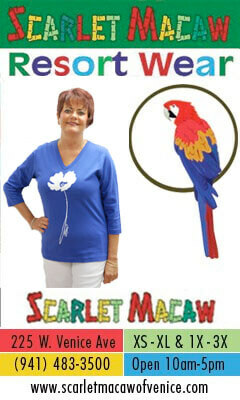 The Scarlet Macaw features quality women’s clothing perfect for you! We proudly carry sizes XS – XL, and 1X – 3X. Sea Pleasures & Treasures is an iconic Venice gift shop on the corner of Venice Ave and Nassau St, right in the heart of downtown Venice. Here you can find all kinds of Venice souvenirs. Seaside Chic Boutique is a destination shoppe for women of all ages. Their unique offerings include chic fashions to take back home, or to be among those must haves in your suitcase for your next trip. We've got you covered for beach weddings, touring Europe, travel & cruises, sultry evenings, garden parties, casual events, hip and hop around town, and special occasions!